This was originally posted on March 9, 2013 on my blog on Gamasutra. I really should have cross-posted it here in the first place. BitSummit is awesome and I am proud to have helped out with it. I fully intend to help again next year. So, BitSummit happened on Saturday. It was a one-day event organized by James Mielke and Q-Games with the goal of helping Japanese independent game developers expand their reach. Epic Games, Unity, and Valve were in attendance to promote their tools and western media representatives from outlets including Wired, IGN, and GameSpot came to see what the game developers already had to offer. The presentations were mostly informational, but James Mielke had the opening speech, in which he talked about his reasons for organizing the event. With the world of independent game development expanding, he feels that it’s a shame that talented Japanese independent developers see less recognition for their efforts. Japanese developers have a different pool of cultural expectations and experiences from which to draw, he pointed out, and the games they make reflect that. Mielke believes independent game developers in Japan have a lot to offer the industry, and that’s why he put BitSummit together. 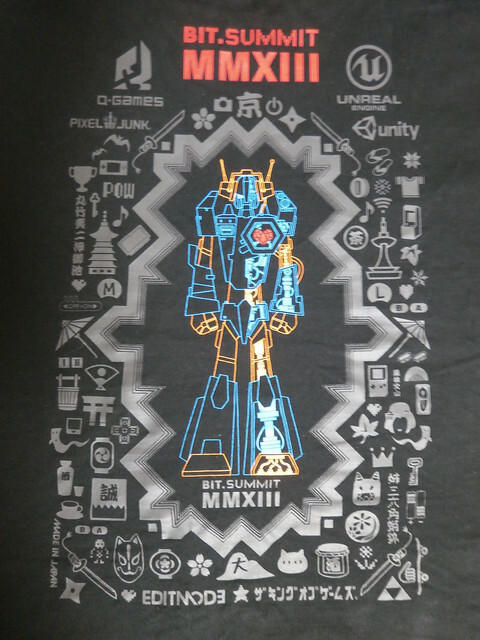 The BitSummit T-shirt back was deliberately designed to include not just video game icons, but references to other parts of Japanese culture.